My favorite diff tool (and it does so much more) for a long time has been Beyond Compare. 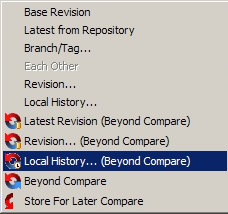 When I started using SVN and Eclipse - I looked for a way to integrate Beyond Compare into the mix so I could use it to compare my working copy against the repository. I found Beyond CVS - but unfortunately it only supported CVS. :( There were a few comments on there asking for SVN support and I added one myself and promptly forgot about it. Well a few days ago I got an email from the plugin author informing me he had finally updated things and added support for SVN!!! Woot! To install - simply download the ZIP (make sure you grab the one with SVN support! ), extract the ZIP and copy the /features and /plugins directories to your existing Eclipse directory. UpDate: Looks like the new 0.8.x version requires Eclipse 3.4.